Department Of Fisheries, Maharashtra recently released notification regarding the Assistant Fisheries Development Officer Group C (Technical) 79 posts. 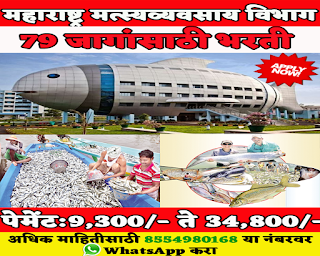 Candidate who are applied for the recruitment for for Department Of Fisheries 2019 now able to download their hallticket on the official website of mahapariksha. Scroll Down & Check the Important Links section. Click on Maharashtra Fisheries Department Recruitment 2019 Download link. Now, an official website of Mahapariksha will open. Log in with your User Name & Password. Now click on the Download Hallticket Option. After clicking on download option your Hallticket will be downloaded.